I struggle with prayer. I make no secret of that. I’ve even tried to write a blog post about it, but every attempt feels too small, too arrogant, too ignorant. I am always incredibly thankful for the medium of worship to communicate with the Lord, particularly when my prayers feel the most unwieldy. It’s difficult to even choose a handful of them to recognize, but these are my steady go-tos that I feel myself flip to time and time again. In case you didn’t know, meeting Amy Grant is the highlight of my bucket list (I do not have a bucket list, but if I did, this would be the headliner, and possibly the only thing on it). This song came out when my grandfather was losing his battle with melanoma and quickly became an anthem during those months. Since then it’s transitioned into a standby to remind me it’s okay if I don’t have the words. Thanks, Amy, you goddess of song. My good friend London sang this during the prelude to our wedding. The only thing I hate about our wedding is that I could only hear her singing it while I was tucked away in the eaves. I sang this over and over again while I was pregnant with Nora Beth, praying that He would be her vision. During the 8 week stretch in which we waited to find out if Nora Beth’s brain cysts had vanished while I was pregnant, I listened to this old school classic on my way to work every single morning. While “This Little Light of Mine” is technically her lullaby, this is our encore many nights a week. It’s just so lovely to envision God’s fingerprints as they shaped her into perfection. This isn’t a traditional worship song, and I can’t pinpoint what about it brings tears to my eyes each time I hear it. It isn’t one that I cue up regularly, but it is beautiful, and I love it. The worship of my church blows me away, and it’s hard to choose only a few songs to highlight, but this upbeat ditty is one of my favorites when it’s just time to praise. You know what I mean. This song. Oh this song. “A miracle can happen now, for the Spirit of the Lord is here…” Yes, Lord. God is so tangible in this worship song, and I’m so thankful for its timing, its truth, and its power. Combined with Hillsong’s “Oceans,” this song was a battle cry during round 1 of our infertility journey. I would tell you that I have hope and that I trust God, and I remember His goodness and His promises, but I often need the words set to music to truly feel that in my Spirit. Thanks again to Elevation, I’m able to when I listen to this. This is the first of three Matt Redman songs making the list. I love it. I love it. I love it. I love it. As a matter of fact, I just realized that it’s playing in the background as I type this. 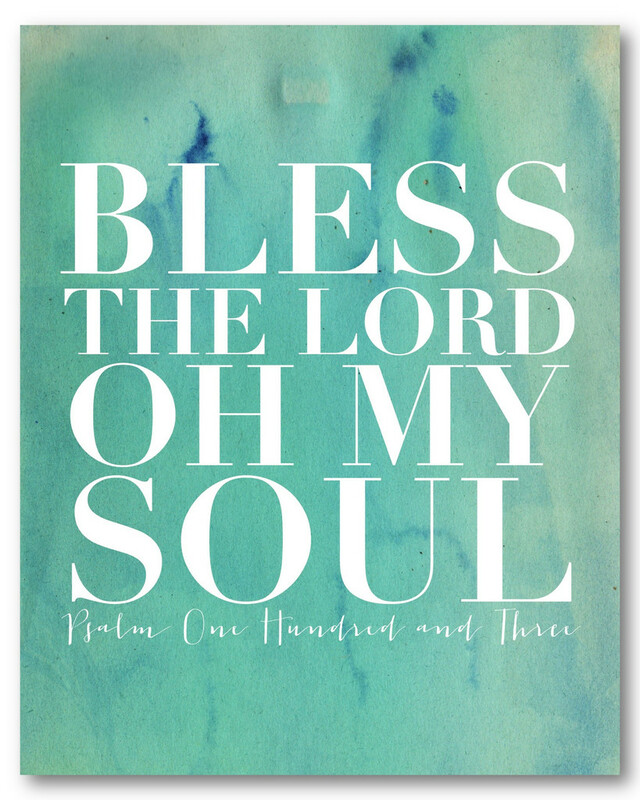 Nora Beth’s nursery features several prints, including a pretty watercolor from Naptime Diaries showcasing a line from this song, “Bless the Lord, O my soul.” This was another song I listened to repeatedly during our 8 week wait to learn if her brain was fully healthy. This lady powerhouse is a dynamo, and this song is just… it’s wonderful. I cry every time we sing this in church. I’m not even kidding. Every. Single. Time. When we miscarried in the middle of walking through another loss, I don’t know how to describe my emotional or spiritual state. Anger and questioning weren’t necessarily what I was feeling, but at the same time, I wanted to kick Satan squarely in his fiery gonads. Enter Kim Walker Smith. On repeat. On max volume. Ugly singalong style. As much as I didn’t want “Come Thou Fount” to be my miscarriage song (you know you have that dress is that your “funeral dress” or “rehearsal dinner dress,”), for some reason, this settled in in that role instead. I still love it and listen to it several times a week, but it’s attached to those few weeks, but the prayer is universal.